"Without teamwork, you will never survive. Without betrayal, you’ll never win." 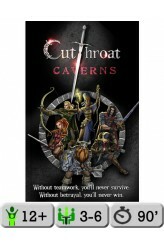 Cutthroat Caverns is played over 9 rounds, each with a random encounter. Essentially a game of 'kill stealing'. Each round, any monster encountered will have a prestige value of 1 through 6. The player that successfully jockeys for position and lands the killing blow gets the prestige value for the encounter. Some encounters will not have a specific monster, such as a trap room for the heroes to pass through (and in this case, earning no prestige). The surviving player with the most prestige after the 9 encounters is the winner. If the players do not survive all 9 encounters, no one wins the game. A unique combination of cooperative game play and opportunistic backstabbing. .. Pass with care... Many are the paths to power: brute force, subtle deception, cunning trickery. You hold the cards...but you can't keep them all. What will you decide to collect for personal gain? And what are you willing to give up in order to destroy? The Ravens are gathering, many of whom used to be rivals. Will you rise to power or simply be...nevermore. 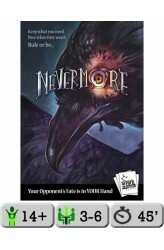 Nevermore is a casual-style, card-drafting game in which you quickly build your hand each round, collecting cards you want and poisoning your opponent's hand by passing along cards you think they can't use. Whoever holds the most of a given suit, gains the power of that suit to attack, heal, acquire Light or Shadow magicks and score victory points. Will you transform all your rivals into ravens — or can they regain their.. Investigate unspeakable horrors without losing your marbles — literally! The veil between worlds in thinning, an ancient horror is awakening, and the very existence of the world hangs in the balance. You must investigate a series of horrific locations and discover the unknowable truth before the world ends — or go mad in the attempt to save it. Find the paranormal gates that have opened onto our world, and be stout of heart and strong of mind for only then will you discover how to seal the gates and save humanity. In Tower of Madness, a three-dimensional clock tower, standing a foot tall and filled with marbles of four distinct colors, stands before you. 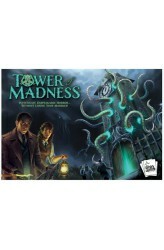 Thirty unworldly tentacles push through the tower walls in every direction in this high-tension, push-your-luck dice game..